Question: How were the letters of the alphabet created? 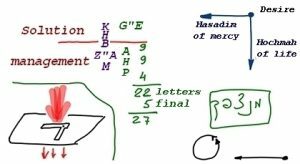 Answer: The letters of the alphabet came to us from Adam HaRishon (the First Man), he was the first who became similar (Domeh) to the Creator. Adam was the first to discover the upper world and its results in our world. All things that exist in the spiritual world are the roots, and everything that exists in our world is a result descending from the spiritual world. The two worlds are completely identical except that the upper world is a world of forces and our world is a world of matter. Even all the forces active on the surface of the Earth (electrical, magnetic, plasma, atomic, etc.) are also considered as part of the material world. It was from these that Adam HaRishon discovered the roots of our world, meaning the upper world. He saw how the forces that manage our world descend from these roots according to particular rules. Adam understood the meaning of the upper management and its implementation. From this, he formulated these laws and described the structure of the letters. Everything that exists is derived from a single black point, desire. From above to below, there are extensions from this point, which means that the Light of Hochma, the Light of life (the vertical line in the drawing), extends into our world from the upper world. 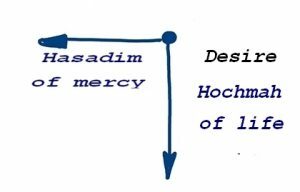 Simultaneously, a horizontal force, the Light of Hassadim (Light of mercy) can also extend. The management of the world consists of three elements, one point and two lines, a horizontal line and a vertical line. In fact, everything is managed through an integration of these two opposing forces, like the integration of plus and minus. Adam felt these forces in the spiritual world and began to study and investigate them. Because the upper world is composed of parts called Keter, Hochma, Bina, Zeir Anpin, and Malchut, Adam began to investigate the ways in which the upper world influences our world. He discovered that the spiritual world is divided into two parts. The upper part is called Galgalta ve Eynaim (the characteristics of bestowal) from which comes decision. The lower part is called AHP (the characteristics of reception) and the management is derived from there. Based upon his investigations, Adam described the structure of the letters. The first nine letters are found in the last part of Bina, the next nine letters are found in Zeir Anpin, and the last four letters are found in Malchut. There are a total of 22 letters, 22 standard models of management. There are another five final letters Mantsepach (MNTzPCh) for a total of 27 letters. The Upper Light passes through each letter like through a mold and descends down in the form of that letter. The Light resides above the letter like a single simple, amorphous, and homogeneous Light, a Light in which there is nothing special. Each letter is a separate Kli (vessel), which is a combination of the two forces, Hassadim and Hochma. Their vector is constantly changing. Each letter is a specific stamp through which the upper force operates. The upper force passes through the mold and clears the way for its influence in our world in a particular way. A word is a collection of letters, similar to a computer command. Question: Why does the drawing show only two lines if the control is in three lines? How is the third line reflected in the letters? Answer: The fact is that the third line goes from the creation, from the bottom upward. And the drawing shows the management from the Creator, from the top downward. In the letters, there is no expression of the man himself, but only the extent to which we allow it to write letters to our desire. Question: Why is it said that the Torah was written with a single word?